Oscar Morris Quarles works remotely on one of our first sunny days in ages. Some have asked, "Jeanine, where do you find your poetry?" Well, we have a secret weapon--one of the stars on our team who reports directly to Megan. 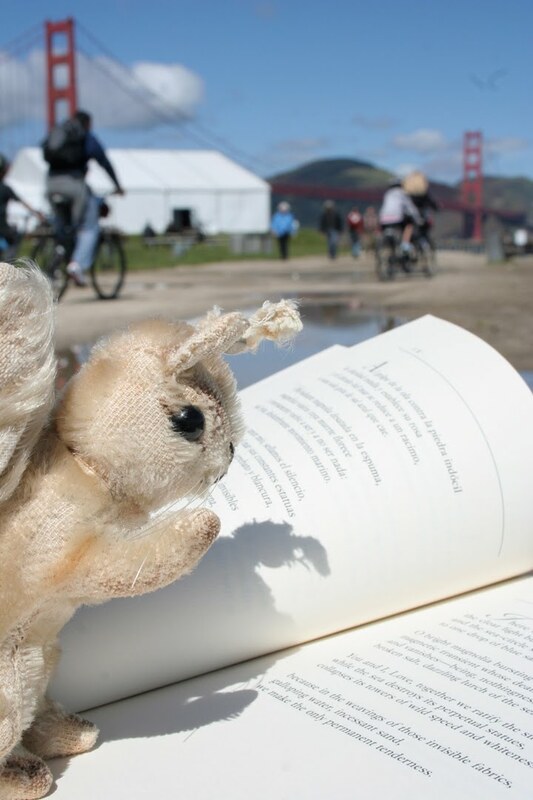 Stay tuned to see where Mr. Quarles travels this month on his celebratory tour in honor of National Poetry Month. For PoMo we are celebrating by having a small contest, as one should. For details on how you can receive one of our Three Treasures Books we will be giving away, click here. as the planet around light. Our new collection speaks to the dreamer that is inside all of us. Necklaces comprised of wings, flowers, miniature books of poems, and stars. 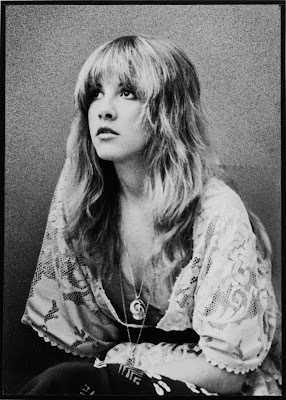 Reminiscent of one of my favorite fashion icons ever - Stevie Nicks. She is the quintessential California girl and undisputed jewelry layering queen. A gypsy and a poet - a lover and a dreamer. Who wouldn't want to live in Stevie's world, which is full of lace and paper flowers, with mirrors in the sky and bells in the night? Today in celebration of International Women's Day we are releasing a special collection featuring poetry about resiliency and courage. 50% of the proceeds from these pieces will go to Mountain2Mountain, a non profit organization working to provide education and opportunity for women and girls in war-torn Afghanistan. When Shannon Galpin, the founder of M2M, contacted me about collaborating I felt incredibly honored. She is an inspiring woman who is doing important and wonderful work. Again, I am so honored and to create these special pieces for M2M and to be asked to be part of this cause. Below is Shannon's Huffington Post blog telling her story and how we came to meet. My talisman is a silver ring that I've had for several years. It's now scratched and has a small dent but I wear it every day because of the words inscribed upon the silver. Words have power. We use them to express feeling and invoke emotion. Words can rally the masses, rage against injustice and soothe a broken heart. Time and time again, we return to familiar passages, quotes and phrases to remind us of how others described what we have felt. I am a lover of the power of words. I surround myself with quotes from Churchill, poetry from Hafiz and the words of great orators, philosophers and writers to inspire and push me forward. Several years ago my family gave me the silver ring that has become my talisman - a piece from San Francisco designer, Jeanine Payer. The inscription by Longfellow reads, "the lowest ebb is at the turn of the tide." They gave it to me to remind me to be strong, follow my heart and believe that the tide would one day turn. I had recently cashed in all of my meager personal funds to launch a nonprofit called Mountain2Mountain, an organization dedicated to empowering the women and children of Afghanistan. I had a two-year-old daughter and I was taking a huge personal risk. Nevertheless, I decided to set the best possible example for my daughter by investing in the belief that I could build a sustainable organization that could benefit women and girls for generations to come. I've never looked back. There is an unusual strength that comes from wearing the words that inspire us. The power of words in a tangible form, present on our bodies, is like a whisper in your ear, "be strong, be brave, don't give up". Jewelry is not the first thing anyone would normally reach for when selecting an appropriate wardrobe to take to a war zone. But it has been for me. I've worn that ring on every trip to Afghanistan. Jeanine didn't know it at the time, but she was with me through multiple trips, under burqas in Kandahar, sleeping in village homes, and inside women's prisons. She rode a buzkashi horse, fished in the Panjshir river, and was there when I became the first woman to mountain bike in Afghanistan. She has survived suicide bombs and gun attacks. Her ring and those words have protected and inspired me through it all. The ring has been a constant reminder that the turn of the tide is always coming, wave after wave, day after day. Today the ring is criss-crossed with scratches and has a small dent, but even that reminds me of everything I have accomplished, with Mountain2Mountain, and as a mother. It's always with me, not like a lucky pair of socks, but as a powerful amulet bestowing courage and hope even in the darkest of times. Its words inspire my next steps, linking my future actions to the words I wear. A few years ago, on my birthday, my parents gave me a pair of Jeanine's earrings. "I dwell in possibility," they say. While I don't wear them as often, I smile every time I slide them on. Every time I wear them, I dwell in possibility. They remind me that everything and anything is possible if I am willing to forge ahead. A few months ago I reached out to Jeannie to share the story of my ring and thank her for all it's meant to me. I asked if she understood the power of her designs and the inscriptions. She sent me a link from People magazine that talked about the power of words and talismans. She is keenly aware that aware that words can spark change and inspire courage. "The lowest ebb is at the turn of the tide"
It is my sincere hope that our collaboration, the power of these words, and the proceeds that go to help us empower more women and girls in Afghanistan will help lead to a turning of the tide in women's rights all around the world. Take a look. Wear the words. Stand firm, and dwell in the possible.